Create a meaningful learning experience. Do not have your students create technology projects only for you. Instead, establish an authentic audience. An authentic audience is a real group of people that will view the work, such as other students, parents, community members, experts, or e-pals. Create an authentic audience for technology projects to motivate students. As you may be aware, the Grade 8 students are working on the technology project TechnoEnvironment and are creating a postcard. This was the second class for this assignment after their guided discovery lesson to explore the Microsoft Publisher tools. Now that students were experts at using the program, they were asked to write to the students at the school and request help to solve an environmental problem. NOTE: The TechnoEnvironment project has been a favorite for many years. Unfortunately, it is no longer available. To find other TechnoKids projects view the Project Matrix or visit the TechnoKids website. 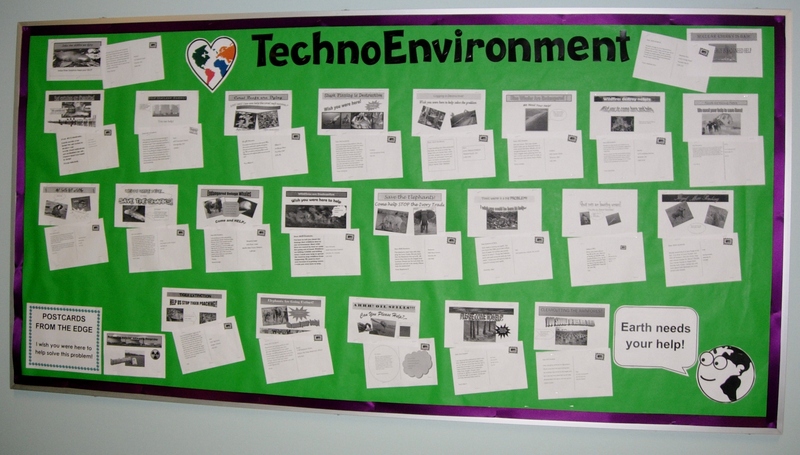 A bulletin board in the front foyer was created in advance of class. As students walked into the computer lab they passed the blank board with the heading TechnoEnvironment and a sign that read, POSTCARDS FROM THE EDGE, I wish you were here to help solve this problem. 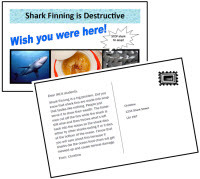 Sample of an environmental postcard about shark finning. Students were told that their postcards would be posted onto the bulletin board and viewed by fellow students at the school. This created the authentic audience needed. Students designed eye-catching publications with text that was phrased so that young children could understand the environmental issues. I did not restrict the postings to only the best publications. Instead everyone’s work was used to decorate the bulletin board to celebrate all of their efforts. The Grade 8 students were very focused during class time as they completed their postcards. 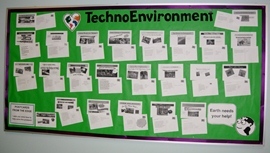 Once their publications were posted they made positive comments about the overall appearance of the bulletin board. Now that their work has been on display for a few days I have noticed that many students stop to view the board and visitors to the school have remarked about the quality. There is no doubt that having an authentic audience created a more meaningful learning opportunity. Why Create an Authentic Audience?